Location: Nimpo Lake is located in the heart of British Columbia's remote Chilcotin Country. At the city of Williams Lake turn west onto Hwy 20. Nimpo Lake is located approximately 290 km (180 mi.) from Williams Lake on Hwy 20. Resorts & Campsites: Many resorts. All services and facilities are available at Nimpo. 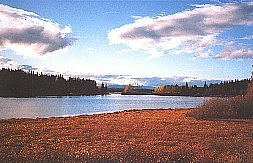 Fishing Report: One of the sites of the 1994 Commonwealth Flyfishing competitions, Nimpo Lake is an excellent lake producing 3 pound rainbows on the fly or by spinning and trolling methods. Charter air services provide remote fly-in opportunities. In fact because of it's many fly-in wilderness fishing adventures, Nimpo is often considered the "floatplane capital of BC". Nimpo Lake offers complete vacations for the family, including horseback riding. Click to view Bathymetric Map. Viewscape: Nimpo Lake is situated in the foothills of the coastal mountain range, resulting in breathtaking scenery and crisp fresh air. Surrounding countryside consists of pine, Douglas fir and spruce forests. Shoreline: Consists of gravel, sometimes grassy with willows, poplars and the odd stand of old conifers around the lakeshore.